With growing automation in various industrial verticals and advancements in technology, garbage trucks no longer lag behind in terms of technology. Considering that garbage collection vehicles are a noteworthy investment, the need for inculcation of high-end features among end-users is surging. Attributed to this, manufacturers are increasingly discovering new ways for extending the life as well as imbibe additional features such as real time monitoring, addition of various novel equipment for collection of waste from streets, and segregation of waste. Moreover, dynamics such as growing awareness for proper waste disposal facilities are expected to propel the demand, especially in emerging economies such as India, ASEAN countries, and those in other parts of Asia. Burgeoning industrialization in urban regions ominously contributes to substantial amounts of waste generated by various sectors. For instance, large industrial base in North America is leading to increasing rate of waste generation in the country. Several manufacturing industries such as automotive, chemical, food and beverage, construction, and others generate huge amounts of liquid and solid waste. According to a recent estimate, approximately 7.6 billion tons of industrial solid waste is generated and disposed of in American industrial facilities. After evaluating the sternness of the problems arising due to untreated disposal of solid waste and effluents, state governments and EPA (The United States Environmental Protection Agency) have issued a voluntary instruction for industrial waste management. Garbage trucks constitute an important part of industrial waste management systems. Furthermore, technological advancements in the development of garbage collection bodies so as to advance their operating efficiency is a core factor responsible for their increasing adoption for industrial purposes, which is a core facet fueling the demand for garbage collection trucks during the forecast period. Europe has also been a prominent manufacturer of refuse collection vehicles (RCVs) owing to high customer base and stringent government regulations, which limit the import of trucks from other regions. Manufacturers based in Germany and the U.K. are focusing on the development of CNG-based vehicles as well as electric and hybrid electric vehicles. 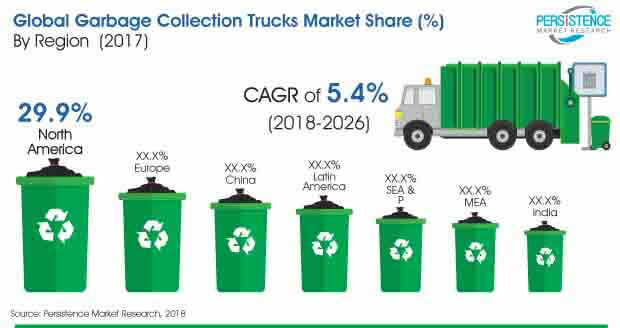 In accordance with the above, the market in Europe is flourishing with the sales for garbage collection trucks increasing at an exponential rate.